April 14, 2006: 12:07 A.M. I remember the stained glass window that shined bright in the dusty Soviet era stairwell. It seemed so perfectly out of place in those hopeful and yet bleak surroundings. I remember the tarnished and road-weary aluminum milk truck that came to a dusty stop beneath the proud Russian Birch tree and the sweet nannies in their socks and sandals as they walked with containers to meet the bearded driver. I suppose our donation was already being partially spent to provide a few days worth of fresh milk to the many babies and children who remained. I remember Aleksandra, her warmth and soft smell and her tight, tiny grasp in that massive country as I fearfully held her as my own. Surely we wouldn't be permitted to steal her away. I remember the air ceasing to move and the earth stopping to watch when she smiled at us. I remember that moment when my soul changed as the judge began to sign her name on our approval. I remember my surprise as my emotions found their release with sweet abandon as we stood there. I remember my daughter's precious, loving doctor who shed a tear of her own when she spoke those words of advice to this new father of a little girl. I can replay in my mind perfectly her smile through tears as she gave Aleksandra a quick look and a final squeeze. Her emotion filled me... I feel the power to this day. I am in wonder of how all this came to be. I remember so deeply the tear-filled evening as Kel and I wrestled and prayed with the question of her adoption and the possibility of her illness. And, the overwhelming conviction, the sheer assured determination that our decision was right. Never have I felt so sure, so content, so resolved about anything. I can still feel the tremendous release and soul engulfing appreciation as we learned on the doorstep of the notary that our Sasha was healthy! And, oh! My heart still quickly beats when I play back the fast running rush through the streets, to beat a deadline, racing blood work on foot because traffic prohibited our progress. I had never felt so alive! These emotions paralleled the birth of my son, when I was there to sever the umbilical and pull him close. Twice I had been allowed to experience miracles. The miracle of birth, and the miracle of adoption. Both acts such a deep part of my own personal faith. I am in awe. I am thankful. God has taught me to wonder. I weep in happiness. My cup overflows. I grasp the meaning now of, "I shall not want." And I long to go again. I read these words again tonight, now five years since I have seen them. I had written them and forgotten about them in the bottom of my writing trunk. But now the memories flood back like breakers. 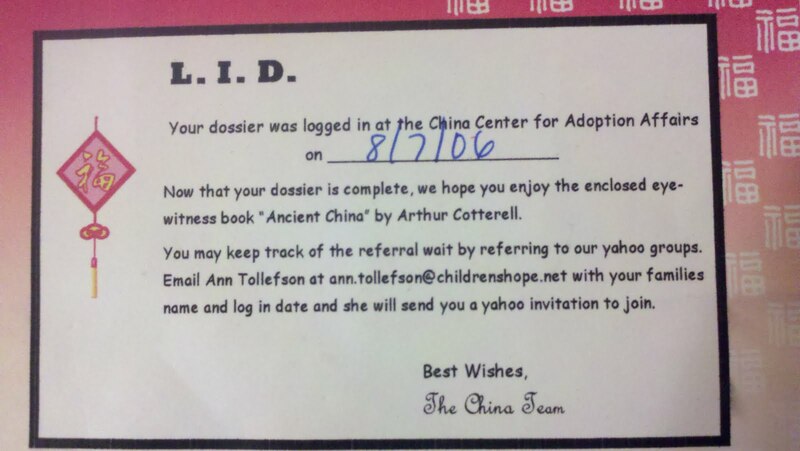 As I read them, I am taken back to those days when Kellie and I knew that we had to adopt again. 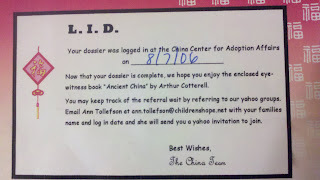 We read countless books and articles and spoke to other adoptive families. Our hearts turned to the Chinese situation, with thousands upon thousands of infant girls who could give love to a home, and be a daughter and sister to our family. We began on a journey that spring that we still walk today, 5 years later. Adopting our daughter has given us so much, and the most frequent question asked at our house continues to be spoken from both Aleksandra and Caleb, "when is our sister coming home?" We started out about 80 travel groups away, anticipating about a 2 year process. We now are down to 5 travel groups, and we are beginning to feel our spirits quicken. patience, and lessons of life, and wait. And--of course, complete mountains of paperwork (multiple times) and pay fees!